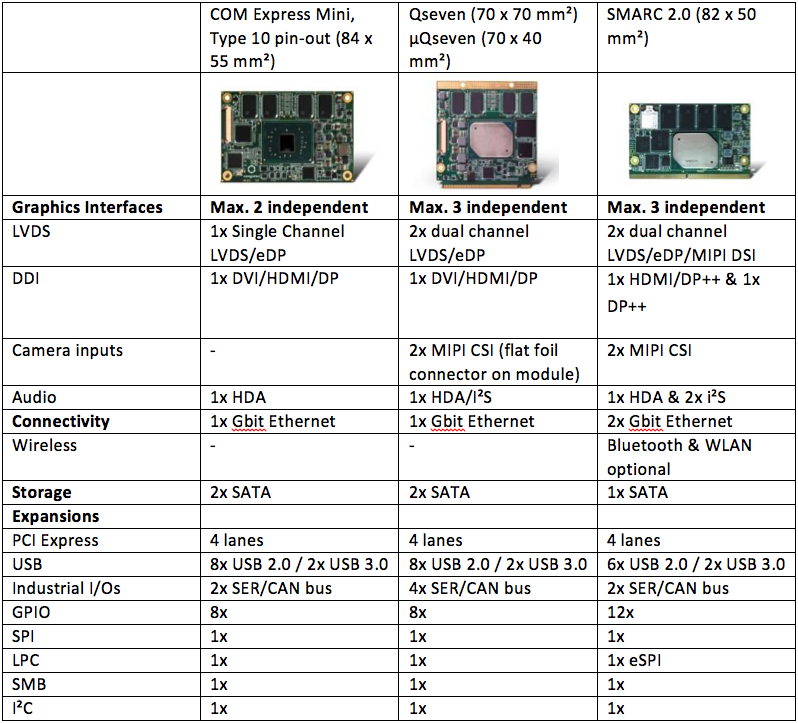 Home » Embedded Computing Design » Credit card sized COMs: Which form factor to choose? First off, here’s some reassurance; the industry mantra, “Never change a running system,” still holds. Engineers who have designed their systems on the basis of COM Express Mini or Qseven have chosen a reliable platform and they can continue to work with both form factors for many years to come. But what is the recommendation for new system designs? What should those system designers consider? There is no easy answer to this question, and market insights are required to make a good decision, so let’s start with a brief look at the history of computer-on-modules (COMs) to see the entire picture. Credit card sized x86 modules have a longer history than one might expect because first variants were available before the small form factor trend had started. DIMM-PC, the first standardized credit card sized form factor based on x86 technologies, was introduced as early as 1998. It measured 40 mm x 68 mm and was based on the DIMM memory socket, with 144 pins dedicated to the ISA bus in combination with additional standardized I/Os, including keyboard, floppy, IDE disc, LPT printer port, serial interfaces, and some others. It offered a standardized and scalable core for dedicated systems. This modular approach was new and founded the market of standardized COMs, as DIMM-PC became the first de facto standard of this new category of x86 boards. DIMM-PC modules had no sophisticated graphics (CRT was common) on board because in those days the graphics was most often found on a dedicated chip, even in low power devices. Thus, the graphics had to be designed in on the carrier board. DIMM-PC modules were equipped with the leading low power x86 processors of these days, such as ALI 386SX with 40MHz, STPC Elite with 100 MHz, or AMD SC520 with 133 MHz. But enhancements in processor performance led to a dead end for DIMM-PCs because processors became larger. The Intel Pentium M processor, introduced in 2003, and most of the x86 processors that came out in the first decade of this century were too large and power hungry for credit card sized modules. It took several years before new credit card sized modules were launched again. In the meantime, expansion buses such as PCI and PCI Express were introduced and new COM form factors evolved. The next module standard to become available was ETX in 2000, with ISA and PCI support. COM Express, which was officially launched by the PICMG in 2005, added PCI Express. Both form factor standards were significantly larger in size than the then-common processors. The usage model of processor technologies also changed within that timeframe. Notebooks, tablets, and smartphones came up, and the now long-term trend of smart small form factor devices was born. As these devices used both processor rivals, x86 and ARM, it became necessary to rethink the way new credit card sized standard form factors for COMs needed to be designed. The COM Express Mini form factor, ratified by the PICMG in 2012 as a derivate of the COM Express Basic and COM Express Compact form factors, did not address the need to integrate ARM processors and instead remained within the x86 ecosystem – but Qseven and SMARC did. Therefore, if you are targeting ARM-based designs or designs that incorporate both processor architectures, it is recommended that you scratch COM Express Mini from your list of choices, as COM Express simply does not serve that architecture. Instead, COM Express offers benefits that neither of the other module form factors has. It features the longest roots as a leading module standard, since COM Express was already introduced in 2003 as ETX Express and adopted by the PICMG in 2005. Consequently, the credit card sized COM Express Mini is embedded into the long-established and comprehensive COM Express ecosystem. Thanks to unified connector technology and design guides, developers can reuse many features even if the pin-outs of the module sizes differ in some areas. COM Express Basic and Compact are offered with Type 6 pin-out (and now Type 7 for servers) and COM Express Mini is offered with COM Express Type 10 pin-out. Nevertheless, designers have one standard they can leverage to scale their designs on the basis of COM Express, from Mini modules with Intel Atom processors up to Intel Xeon D processors for the server segment. There are some limitations because of pin-out variations, but the rest – including marketing aspects such as offering the leading COM Express standard – is consistent. The fact that COM Express Type 10 offers only 220 pins is slightly limiting. Still, in terms of I/Os it provides a complete PC-like feature set, including LVDS and DDI graphics, Gigabit Ethernet, PCI Express, and USB for generic expansions, as well as serial interfaces and GPIOs. And finally, who uses all the different I/Os in one design? Overall, COM Express Mini is a mature option, but if your designs are not joined with further COM Express designs, then Qseven and SMARC 2.0 may be more attractive. So what distinguishes Qseven from SMARC 2.0 and vice versa? 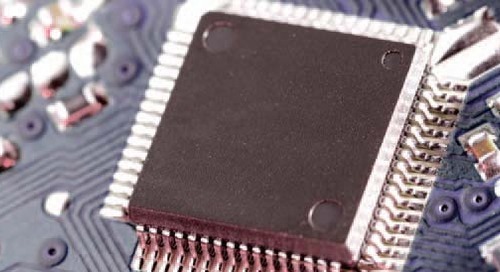 On the connector side, Qseven offers 230 pins and SMARC 2.0 offers 314 pins. SMARC is more oriented towards feature-rich multimedia applications, whereas Qseven offers more I/Os, as required by the deeply embedded and industrial arena. All the other benefits are comparable. Both standards enable slimmer designs compared to COM Express because of their flat edge connectors. Both have reliable connector vendors, with three vendors supporting The Qseven connector and two vendors supporting the SMARC 2.0 connector. The difference in the number of interfaces between Qseven and SMARC 2.0 is also somewhat of a price indicator. Qseven is designed for less complex designs and SMARC for the high-end of applications that demand credit card sized modules. In general, any decision therefore depends on the task of the embedded system. Once this difference is understood, you can check out the dedicated interfaces of the preferred module category and then decide whether it fits or not because, from a vendor and market share point of view, the landscape is more or less balanced today. The global COM market is expected to grow at a CAGR of close to 18 percent during the forecast period from 2016 to 2020, and COM Express, SMARC, and Qseven are currently the leading form factors, as latest studies from analysts such as Technavio indicate. In order to finally determine the most suitable small form factor module standard for ARM or x86 low power processors, we now only need to check the interfaces (Table 1). As mentioned above, Qseven ideally suits industrial and deeply embedded designs. For these, it provides outstanding industrial peripheral support via up to 2x USB 3.0, 8x USB 2.0 as well as up to 4x serial interfaces or CAN bus. Additionally, up to two MIPI CSI cameras can be connected via a flat foil connector on the module. For internet connectivity, it further features one Gigabit Ethernet port. As for display support, Qseven modules can drive up to three independent displays. SMARC 2.0 modules offer nearly the same overall feature set, but balance the I/O count more towards multimedia applications for markets like digital signage, vending, and infotainment. Compared to Qseven, SMARC supports up to four independent displays. Also, audio is extended with high definition audio and I²S in parallel, which is common for many handheld consumer devices. In contrast to Qseven, the camera inputs are executed via the connector. One unique feature that SMARC 2.0 provides is support for wireless technologies on the module itself. For that task, the specification reserves a special area on the module that is dedicated to the placement of the miniature RF connectors. All SMARC 2.0 modules with wireless functionality have these connectors in the same position to ensure consistent interchangeability. Ideally, the connectivity for logic devices like WLAN and Bluetooth is integrated in a modular way and in line with the M.2 1216 interface specification. This allows a wide choice of radio protocols, which in turn makes customizations for end user applications highly flexible. Additionally, SMARC 2.0 also supports 2x Gigabit Ethernet, which is a particular advantage for connected applications as it enables two independent networks where the logic and security aspects are fully separate, or cable-saving line and even redundant ring topologies. If you think, for example, of a powerful infotainment and streaming gateway in trains, busses, and planes, you get all the required components pre-integrated on a single module in a credit card format with SMARC. Identifying the best credit card sized form factor is a major step within the design evaluation process of all new connected rugged mobile devices, in-vehicle systems, IoT appliances, and gateways, as well as thin clients up to mini edge and cloud servers. All three latest credit card sized module standards provide distinctive advantages – you can decide which advantage is best for your design. Equally important is the choice of the right module vendor. Here it’s worth identifying the ones that can simplify the use of these embedded modules the most and as efficiently as possible. One indicator for this is that they should offer all form factors instead of only some because it gives you better consultancy as well as better options to migrate from one form factor to the other. Also, have a look at the BSPs, firmware and communication middleware, as they are getting more and more important in a connected world. This does not mean that the vendor should complement its offerings with an entire cloud for the system because it will never meet the needs of a customer entirely. It is more important to have a closer look at what is offered on the board and module level itself. For example, is the board management controller proprietary? Then take care, as it could prove to be a dead end. Better to choose open, non-proprietary APIs because openness and standards are the fundament for the most efficient and simplified reuse of existing engineering efforts. Check also that integration support is offered for ARM and x86, because it is better to get one engineer who supports both architectures for unified product family instead of two different engineers with two different product lines. This also requires unified APIs. Finally, check the documentation. It is better to have more pages of content instead of only the bare minimum. And think also about relying on local manufacturing capacities wherever you or your customer reside. This will allow you or your customer to buy local and can also help with potential government trade restrictions. The major difference between Qseven and SMARC 2.0 is the number of interfaces, which divides the application areas into more deeply embedded applications for Qseven and more multimedia focused designs for SMARC 2.0. The footprints of the various credit card sized modules differ only slightly. Dan Demers is the Director of Marketing for the Americas at congatec, Inc. He holds a B.B.S. degree in International Business from Grand Valley State University, Grand Rapids, Michigan and an M.B.A. from Ashford University, Clinton, Iowa. Mr. Demers has over 19 years of experience in embedded computing, having worked with Fortune 500 companies in the industrial, medical, and communications markets.